...is a strategic card game set in a sci-fi fantasy western where players use elemental spells, their wits, and just the right amount of luck to overcome their opponents. 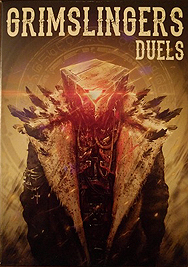 Players will face off using a unique duelling system where everyone's turn happens at once. Careful planning, resource management and luck all come into play for this easy-to-learn, yet deep and competitive game. Components: 60 Cards, 1 Rulesheet.